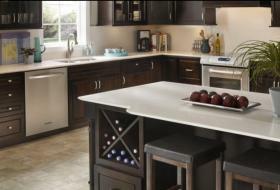 Silestone® is made from amazing 93% quartz with the remaining 7% polymer binder. 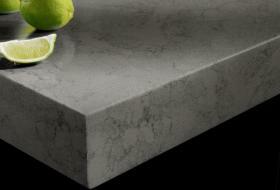 Ideal for vanity tops, work surfaces, cladding etc. Extremely hard, 7 on the 'Moh's Hardness scale'. The quartz used coupled with high performance, stain resistant polymers results in a durable, non-porous, chemical resistant surface. 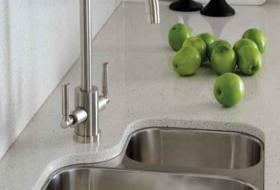 Silestone® keeps its lustrous gloss and ultra-smooth surface without polishing. Because it is non-porous, it does not require sealants or waxes. Silestone® joints are finished with a small ariss to the top edge; silicone sealant is applied to prevent water ingression. Due to thermal expansion Silestone can expand up to 1mm per metre. A gap of at least 3mm should be left at each end of the worktop when fitted and filled with decorators caulk. When Silestone is joined to other materials (such as glass, steel or wood) an elastic type of adhesive, for example polyurethane is required for expansion. A minimum of 120mm is required between two hob cut out. A minimum of 50mm is required between two sink cut outs. 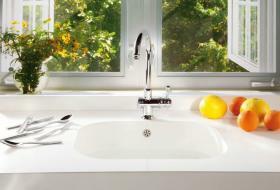 Sink cut outs are placed a minimum of 50mm from the worktop front edge. Internal profile edges on all edge detail other than bevel edge must have a radius of at least 60mm. Bevel edges don't have this constraint as they are hand finished. If a waste disposal unit is fitted to an under mounted sink after installation, additional support will be required, otherwise your warranty may be invalidated. For installations you will need to supply additional labour on orders which have worktops weighing above 150kg. Every additional 75kg requires an extra person to assist with lifting. Size of 'scant' or 'slab', is a major factor in selecting the maximum usable length of a work surface. Approximately 3m x 1.3m is the largest work surface we are able to manufacture; this may be drastically reduced if you require a cut out.